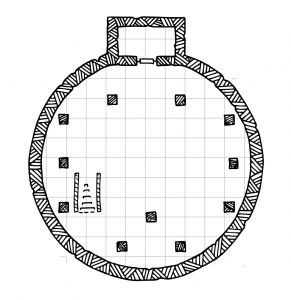 I wanted to do something fun today, so here’s a map that also doubles as a printable d6. Because why not? There’s no journal update this week. The Friday Fight Night posts represent about 4 hours worth of writing every week, and in getting caught up on commissions and other work I haven’t had the time to write it. I’m also keenly aware that – since we haven’t had much time to actually play – we’re rapidly approaching the current point in the campaign in these journals, so I don’t feel too bad about missing this week. That’s not to say that being here is a waste of your time. I only posted half the maps from last week, remember? Here’s the rest of the map that goes with that post. Next week you’ll get to see the rest of this floor of the castle (well, the parts that the party explored, anyway), along with the journal that goes with that session. One of the things I’ve been working on this week is my general organisation with regard to content for this site. It may not seem that way, given I’m missing the journal article this week, but things should be a lot more consistent with regard to timings going forward. If you’re interested in more of this kind of thing, read on. If you just came for Friday Fight Night, then I’ll see you again next week! So, you want to hear more about this schedule business, do you? Lovely stuff. It feels like much longer ago than December that I posted my update schedule. It’s been almost 4 months to the day since I posted that, and reading it again it’s clear I still hadn’t quite realised exactly how much work would go into hitting that three-times-a-week schedule. But I said I’d do it, and although it’s been patchy at times – mostly as course work from my MA started to pile up – I’ve done a fairly good job of sticking to it. I know it may not seem that way from your point of view, but trust me – it could have been a lot worse. There have been a lot of all-nighters getting content ready to go. The Monday Map is actually one of the easier posts. The hard part comes in figuring out what I actually want to draw – sometimes that takes days. I’ve started putting together a list of prompts, though, and I’m planning to do a lot of drawing in advance from next week. Once I know what I’m drawing, though, the map takes up about 4 hours of time. That’s drawing it, scanning it, cleaning it up, and scheduling the post. The drawing obviously takes the longest – the scanning & cleaning part takes maybe half an hour at most, and scheduling it takes maybe ten minutes. Stat Boost varies, from an hour or so for something quick and easy like this week’s 1d10 trinkets, to about 6 hours for something longer like Worldbuilding Through Song and Story. My level 1-20 pregen character took about 12 hours. Friday Fight Night is consistently the biggest time-sink, and it’s no coincidence that it’s the post that suffers the most as far as being on time. The maps take an hour or two, and writing the post takes about another 4 or 5 hours on top of that. They’re usually a few thousand words, and require me to go back over my notes from the game and make sense of them. It also usually has to wait until late on Thursday night to get written, because I have work and university of a Thursday too. (And when I say late, I mean late. It’s 4:30am currently, and I’m wrting this instead of Friday Fight Night). The Best of DMs Guild roundups are an ongoing thing and I have no real way to quantify how long they take – though I may just keep track of it next month. I check DMs Guild every day, looking for new products that seem interesting. I have to read all of them – though admittedly sometimes I know within a page or so that something won’t make the list, and at that point I usually put it down and move on to the next thing. 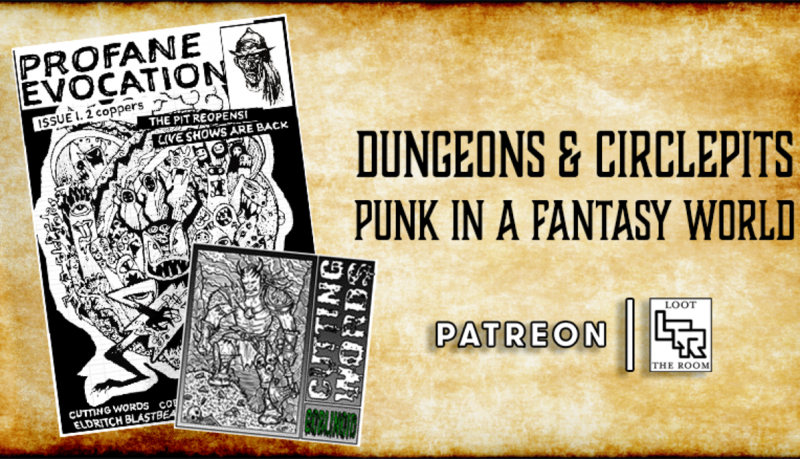 Copiling the post itself – putting the links together, gathering artwork, writing the reviews (if I haven’t already written one for the DMs Guild site) takes a few hours, on top of the time that goes into it every day. I’d say, at a minimum, that I spend an hour a day over the month on it – some days it’s a lot more than that. So, all in, that’s roughly 20 hours a week producing content for this site. That’s not including work I do on my DMs Guild products (and hopefully I’ll have news on that front soon), time spent marketing both this site and those products, and time spent on commissioned maps. Plus, you know, work and uni and life and stuff. I’m not complaining about all of this, by the way. I chose to do this because I love working on the maps and articles that I post here, and that hasn’t changed. I’m just explaining why things aren’t always as on time as I know we’d all like them to be. So, what am I doing to try and improve things? It might seem paradoxical, but the first thing I’m doing as of next week is forcing myself to take a day off every week. At the minute I’m working on something constantly, and although I haven’t burned myself out yet – it’s coming, if I keep this up. And I don’t want that. So I’m having a day off – no working on the site, or uni, or commissions, no reading emails, as little Twitter as possible. The second thing I’m doing it setting aside one day a week that’s purely for working on this site. I often work with something on in the background – right now, Critical Role is on – and it’s easy to become distracted. I’ve blocked out a 9-hour chunk of time one day a week, and during that I won’t allow myself to go online, or watch anything, or get distracted on Twitter. I’m scheduling what I spend that time on in advance, and I’m going to force myself to do it. There are lots of other little changes I’m making – forcing myself to stop at a certain time of night so I get enough sleep, for example – but I won’t go into them all here. Those are the two biggest changes I’m making to my habits, and I anticipate that they’ll help a lot. So, with a little luck and a lot of me sticking to what I said I’d do, you’ll have an improved, on-time Loot The Room as of next week. Thanks, as always, for sticking with me. I’ve been slowly working on detailing Tarnswood and the area surrounding it, with the intention of it forming my next DMs Guild release. It’s almost done, and in anticipation of its release later in February I thought I’d share a sneak peek. This is The Stuttering Mule, one of the two taverns in Tarnswood. Run by Jaxson Jay, a former adventurer who retired to Tarnswood after coming too close to death one too many times. A bard of some renown, if you catch him in the right mood he might spin you a tale or two of his life on the road – but he’s more likely to direct you upstairs, where bards, troubadors, and travelling companies of players regularly perform on the Mule’s large stage. That’s not why the locals spend so much time in the Mule, though. Instead they’re drawn to the Knuckles table where they are happy to spend all night throwing the bones and gambling whatever they happen to have on hand. The table is overseen by Steth Goldblane, one of Jaxson’s adventuring companions, and his eye for cheaters is as sharp as his blades. Adventure Seeds: Tarnswood will contain details of every building in Tarnswood, the history of the town, details of notable NPCs, places of interest and danger, and a full adventure set in a redesigned Temple of Leaves, along with new monsters, magic weapons, and backgrounds for those adventurers who hail from Tarnswood. It will be available on DMs Guild in mid-February. The monks of Suqwuei are silent and reclusive. Cloistered in their walled terraces near the peaks of the Qlilt Highlands, their only focus is in further understanding the mysteries of ki. The shifting sands of their gardens are said to contain the key to forces that link life across all the planes, should you know how to read them; the standing stones resting upon said sands are used in the channelling of ki forces undiscovered by all but the monks who study here. This week’s Friday Fight Night saw the party taking on The Wheelhouse Prison. You may have noticed that it was also released quite late (I’m aiming to have the post up at 11am on Friday – it’s currently 6am on Saturday as I’m writing this). I’ve been swamped with work for my Masters which meant I really struggled to get the posts up on time this week and last week – and I work nights, which doesn’t help either. Why am I telling you this? Because while I managed to get the journal done, I haven’t drawn a map. 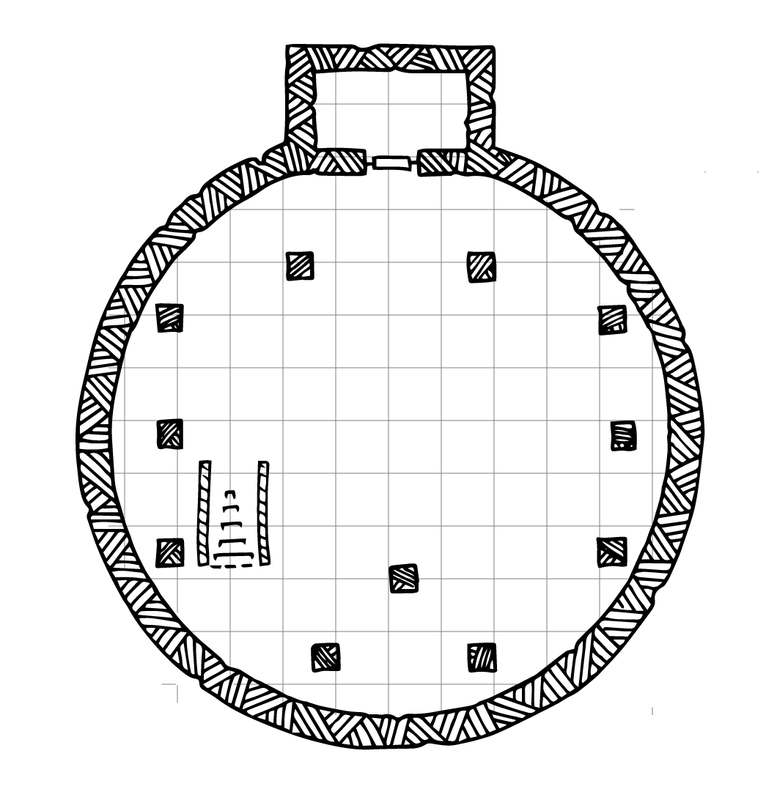 What I’m doing instead is making the maps from my DMs Guild release of The Wheelhouse available here. The book itself is also still Pay What You Want, so if you want to read more about Warden Barnes, Sureshank, and the mage who escaped from the party, you’ll find more information about them there. Grey doors are portcullises, which are controlled by levers located in the second room from the right at the north side of the ground floor. The room immediately to the right of that contains a trapdoor concealing a ladder down to the basement. The levers link up to a mass of machinery in the northern room on the right of the upper floor, which in turn is linked to the large central pillar of the Wheelhouse that is turned by the motion of the waterwheel. Dashed lines are iron bars. In my game this week I decided to use my Hrothgar’s Pass map. And, in printing it out, I realised how much of a pain it is to print a large image over multiple pages. Whenever I’ve printed poster maps in the past I’ve done it at print shops on one large sheet, rather than at home on multiple A4 sheets, so I’ve never had to deal with it. With that in mind, and in an attempt to make my content more useful for you, I’ve decided to start providing my full-size poster maps as PDFs as well as images. I hope this makes it easier for you to print them out and use them at home. If there’s anything else I can do to make things more useful, please let me know in the comments! 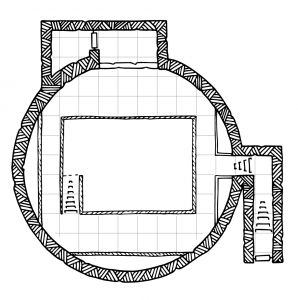 I’m also considering writing the Temple of Leaves up as a full module, so if you’d be interested in that please leave a comment too. The final level of the Temple of Leaves is the catacombs, where priests and the temple elders were buried. 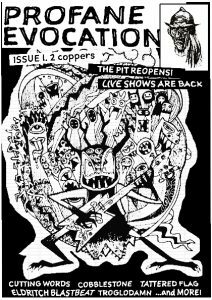 You can read more about the history of it and the reason for the presence of the spectator in this week’s Friday Fight Night. A. This room is used to prepare the dead for burial. Expect to find embalming tools and fluids, incenses, powders and makeup, robes and other clothing, and books containing religious rituals and medical notes. One of the keys required to open the doors in B can be found here. B. Two thick pillars support the roof here, while a pair of ornate stone doors carved with iconography of a forgotten god barr the way to C and the masters’ burial chamber beyond. These doors are sealed with an intricate clockwork lock that requires two specific disks (that act as keys) to open. Cog-like spaces are carved into the stone that these disks fit into. C. An ornate corridor decorated with scenes from the mythology of this forgotten religion. Alcoves along the walls hold statues of strange beasts and creatures, the names of which are consigned to obscurity. D. The masters’ burial chamber, where the elders of the temple were interred. Their tombs are long alcoves set into the walls, each sealed with clay tablets painted with gold leaf. 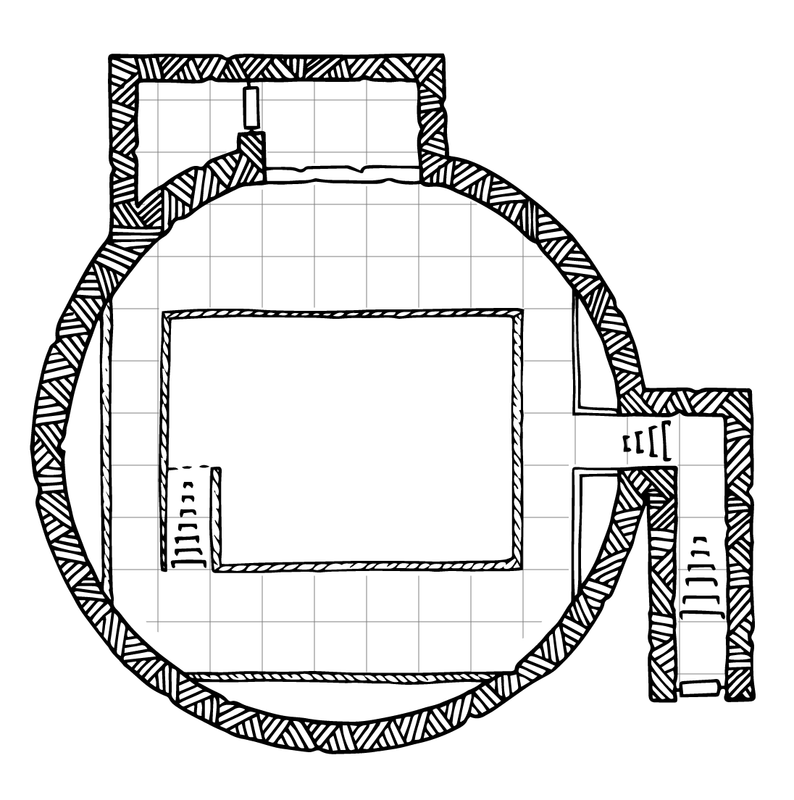 A low well-like structure in the middle of the room is sealed with a thick stone disk carved with arcane runes. This well holds a Spectator. The runes on the stone disk will trigger if any of the tablets sealing the tombs are disturbed, shattering the disk, sealing the doors, and releasing the spectator. E. The space inside this room is bare, but the walls are covered with small clay tablets. Breaking these tablets reveals cubbyholes in the walls that contain the belongings of those interred in the catacombs. F. The catacombs contains rows of low, stone coffins. They are plain, carved only with names and the symbol of the deity that was worshipped here. They hold the remains of the priests who died while in service to the temple. G. A separate burial chamber, more finely-appointed than the catacombs but not as ornate as the masters’ burial chamber. High-ranking clerics who passed before becoming elders are interred here. If you would prefer these images as PDFs for home printing you can get them here (right-click to download).